"Pink Sugar Heart Attack!" 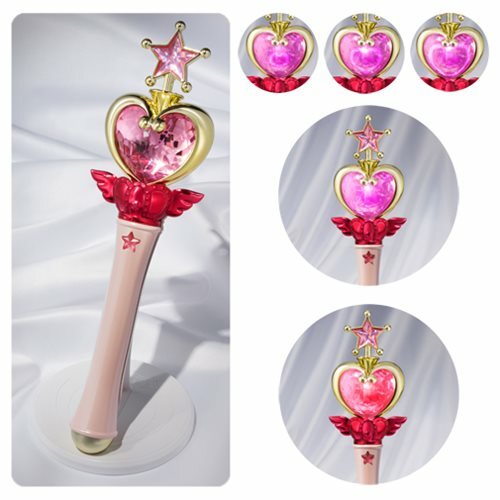 The high-quality, prop-grade Sailor Moon Pink Moon Stick Talking Light-Up Proplica is a replica of the Pink Moon Stick carried by Chibiusa is a must have for Sailor Moon fans. The heart shape is illuminated with LEDs to re-create the appearance of her trademark attack. It also plays sounds and music for the Kaliedo Moon Scope attack! Recreate your favorite scenes. Item measures roughly 10 1/2-inches tall and includes a stand. Ages 15 and up.